The Math Function block performs numerous common mathematical functions. To perform square root calculations, use the Sqrt block. The block output is the result of the operation of the function on the input or inputs. The functions support these types of operations. The name of the function appears on the block. The appropriate number of input ports appears automatically. Use the Math Function block instead of the Fcn block when you want vector or matrix output because the Fcn block produces only scalar output. This table shows the input data types that each function of the block can support. Input signal specified as a scalar, vector, or matrix. All supported modes accept both real and complex inputs, except for reciprocal, which does not accept complex fixed-point inputs. See Description for more information. Data type support for this block depends on the Function you select and the size of the input(s). For more information, see Data Type Support. Input signal specified as a scalar, vector, or matrix. All supported modes accept both real and complex inputs, except for reciprocal, which does not accept complex fixed-point inputs. To enable this port, set Function to hypot, rem, or mod. Data type support for this block depends on the Function you select, and the size of the input(s). For more information, see Data Type Support. 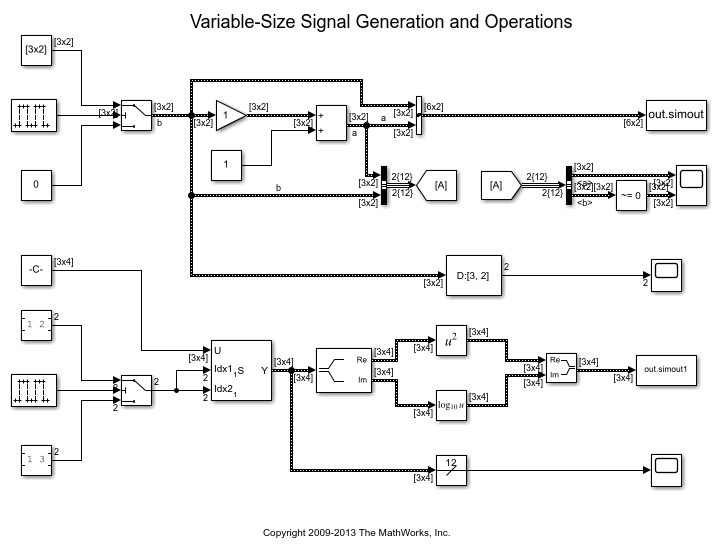 Output signal specified as a scalar, vector, or matrix. The dimensions of the block output depend on the Function you select and the size of the inputs. The block output is real or complex, depending on what you select for Output signal type. See Description for more information. Specify the mathematical function. See Description for more information about the options for this parameter. Specify the output signal type of the Math Function block as auto, real, or complex. To enable this parameter, set the Function to magnitude^2, square, or reciprocal. Rounding mode for fixed-point operations. For more information, see Rounding (Fixed-Point Designer). Block parameters always round to the nearest representable value. To control the rounding of a block parameter, enter an expression using a MATLAB rounding function into the mask field. To enable this parameter, set the Function to magnitude^2, square, conj, reciprocal, or hermitian. The Math Function block has HDL code generation restrictions when you set the Function to reciprocal. For more information, see Math Function. The Math Function block only supports fixed-point conversion in certain configurations. For more information, see the Block Support Table.